I completely lucked out in finding this book. As I've mentioned a couple times before, there is a great bookstore chain here in Austin called Half Price Books that sells used books in usually perfect condition for very low prices. There are a bunch of these stores around here but the one on North Lamar Blvd has an absolutely tremendous selection including a separate room for extremely rare books (I scooped up an obscure Finnegans Wake study there not too long ago plus a great book of Joyce's poetry published in Poland). My girlfriend and I stopped in the other day for a quick look around and I scooped up yet another Joyce study, this one a detailed analysis of Ulysses called The Book as World. It had an infinity symbol on the cover and great reviews so I couldn't resist adding it to the stack I'm studying for my own soon-to-come Ulysses breakdown. But just as my girlfriend was getting on line I thought to go take a quick peek at their baseball section to see if there were any gems. I ended up with exactly that, an immaculate gem of a book. 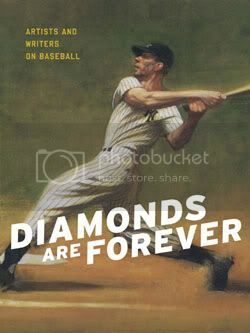 The book is called Diamonds are Forever: Artists and Writers on Baseball and, just as the title suggests, it's a rich collection of artwork, poetry, and essays on the eternal aura of the game of baseball. It's a pretty large book, soft-cover but the size of an art book or so-called "coffee table" book (I've never owned a coffee table but I've got a bunch of these type of books) and it was published by Chronicle Books, a San Francisco-based publisher who seems to produce just about every highly awesome artsy book I come across. For example, my girlfriend received a huge spectacle of a book this past X-Mas from her dad: a collection of New York City subway art images published by Chronicle. [Isn't] that the "job" of the artist? They take those experiences that many of us have and transform them into something new---into paintings and poems and essays that challenge us, or delight us, or touch us so deeply that we're convinced there's magic going on there somewhere...The artist has that rare ability to make the ordinary extraordinary, that rare ability to have us see and experience with "new eyes." The book is in such perfect condition that it wasn't until a few hours ago that I realized it was actually published in 1987. It's apparently a pretty rare, limited edition book that was printed for a traveling exhibition with the Smithsonian Institute. I paid 9 bucks for it! Can't recommend it highly enough if you can manage to find it anywhere.